The final stages of amyloid beta (orange) and tau (blue) progression in someone with Alzheimer’s. The effects of Alzheimer’s disease on the brain often go unnoticed for years, even decades. But researchers at Stanford University and the University of Oxford believe they’ve found a way to visualize how the disease slowly spreads and erodes the brain—a tool they hope can help other scientists better study the incurable, fatal ailment and others like it. Alzheimer’s disease is defined by the untamed growth of two misfolding proteins: tau and amyloid beta. In someone with the disease, both types of proteins constantly accumulate, break apart, spread to different parts of the brain, where they accumulate again, eventually forming hard-to-remove clumps known as tangles and plaques, respectively. It’s this combined buildup that’s thought to slowly destroy brain cells and cause the symptoms of dementia associated with Alzheimer’s. 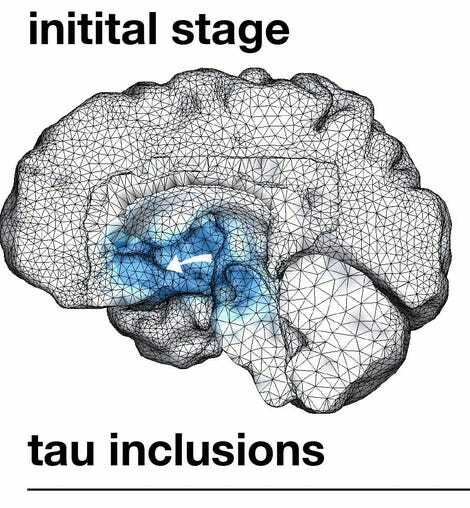 In their paper, published Friday in Physical Review Letters, the researchers showed how they created a computer model that can illustrate the progression of tau and amyloid beta, based on previous research in the field. There are still many questions concerning why these first seeds of misfolded proteins show up, how they convert more proteins to go rogue, and how they actually destroy the brain (more recent research has suggested it’s the earlier stages of amyloid and tau buildup, not plaques and tangles, that are the most toxic to brain cells). But Kuhl and her team say their model can be adjusted to fit all of the leading theories on how the disease works. 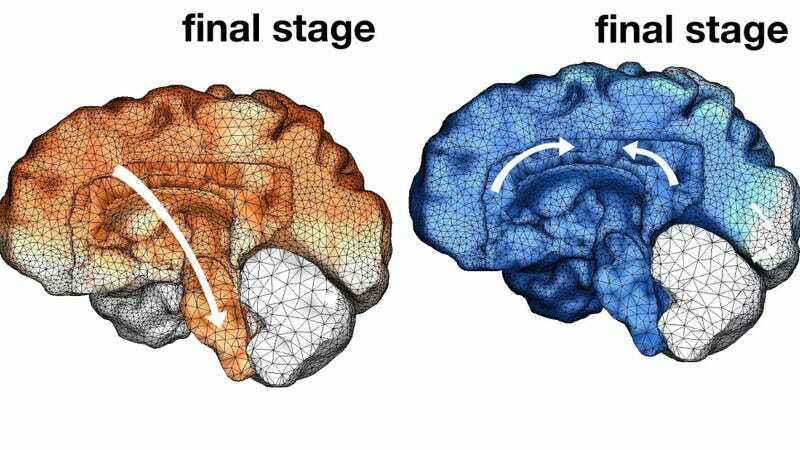 The model, they say, can also be used to visualize the spread of other brain diseases that are characterized by a flooding of different misfolding proteins. To showcase that flexibility, the paper also includes models of Parkinson’s disease and amyotrophic lateral sclerosis. Given the urgency of Alzheimer’s research—with some estimates showing that over 135 million people worldwide will have the disease by 2050—the team plans to share the software used to create their model, which they’re calling The Living Brain Project, with other scientists. “We hope the ability to model neurodegenerative disorders will inspire better diagnostic tests and, ultimately, treatments to slow down their effects,” said Kuhl.